Over the past couple of years there’s been a growing rally cry in support of failure. I first noticed this in 2013, when I had coffee with Harvard professor Sarah Lewis to talk about a book she was writing called The Rise: Creativity, the Gift of Failure, and the Search for Mastery (Simon & Schuster). Lewis initially struck me as a brilliant overachiever who had little knowledge of what it’s like to really crash and burn at something. As we sipped and chatted, however, I began to realize that my initial impression was wrong. The reason she seemed (and is) so accomplished is because she had trudged through the heaviness of failure at different times during her life, not because she’d managed to avoid those low points altogether. Her book, which was published the following year, also highlights individuals who became successes because of the lessons learned from failure, rather than in spite of failure’s potential to throw a stick in our bicycle spokes. In The Rise, Lewis shows us the success that can be achieved when people use their failures as part of an internal learning process. In The Gift of Failure, which will be available August 11, Lahey shows what we can do to give our children the ability to achieve that same type of success. As I read Lahey’s account of the way modern parenting practices provide a cushion from almost every degree of failure a child can experience, I started to worry. America is already known for its anti-intellectual tendencies. Is my generation of parents making it worse? I decided to do a quick mental review of some recent interactions I’ve had with my oldest son, who will be entering third grade at a new school in a few weeks. A couple of weeks ago, when it became clear that my son was likely to be accepted into a small private school in our new hometown, I felt a sense of relief. We’d scrambled to find a place for him after the admissions process at another school had fallen through, and if this one hadn’t worked out, our choices would have been limited. My relief was short-lived, though, as I worried about how my gangly, giggly boy would adjust to the school’s curriculum. The idea of a new city, a new school, and new classmates was already making him nervous. What if, on top of all that, he found that he was behind the other kids on the first day of class? His former school taught Spanish during the elementary years, this one teaches French. His former school relied upon a lot of Common Core math concepts, this one had kept more traditional fact memorization in the mix with the new practices. The new school required students to choose five titles from its summer reading list. Over the course of the summer, my little guy had spilled milk all over one book I’d chosen for him, left another at the beach, and had read two Pokemon books and one from the Amulet graphic novel series cover-to-cover—none of which were on any list. 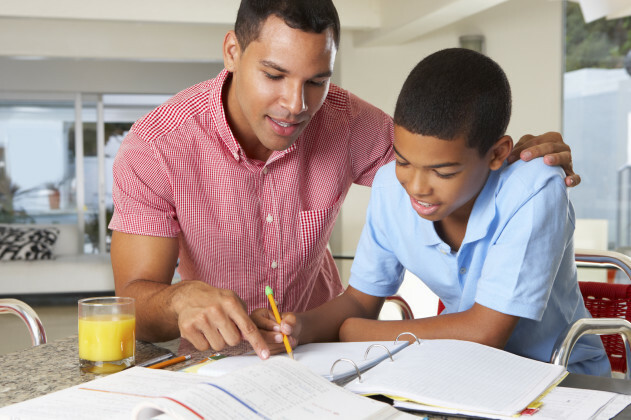 As soon as we left the new school I set out to protect my son’s self-esteem by hiring a French tutor and requiring that he and I go over math worksheets every day. I didn’t expect him to read five books in three weeks, but I didn’t really tell him that, either. Instead I hounded him and gave him required reading time. We spent the next week-and-a-half arguing about getting his work done. Finally, I realized that I was playing to my own anxieties, not his. As a result, he could sense that all of this practice wasn’t really about his mastery of the subjects at hand. I remembered the way I felt in a similar situation as a 10-year-old, when my dad would wake me up at 5am to go over math drills because of my slipping grades at my new school. “Resisted” isn’t a strong enough word to describe my reaction to my father, and now here I am repeating history a quarter of a century later. So, after Lahey’s book prompted me to check myself, I eased up on the pressure and told my son that he could do his reading whenever and wherever he preferred, as long as he finished a couple of the books before the start of school and talked to me about his reading each night. As for the math, I went back to my old method of policing homework. I still print the worksheets for him, but instead of hovering and criticizing, I do something that has caused some of my mom-friends to furrow their brows when I’ve mentioned it in the past. I sit him down with the work and then leave the room. Ever since Jr. started coming home from school with math and spelling to review, I’ve adopted a “radical” stance. Teachers and administrators don’t pull lesson plans out of thin air. Ideally, they are well-trained in how to present concepts to their students and determining the propriety of the material. This is why we call them educators. I am not an educator in this sense. The only things I know about child psychology are from experience, parenting books, magazines, and physicians. And teachers. I’m probably whatever one might call a person who is the opposite of an expert in the pedagogy of elementary education. Therefore, in order to avoid getting in the way of my child’s learning, I prefer to leave the teaching to the teachers, and for the process of learning school material to remain between my son and his teacher. As we’re still in the early years, I make sure he gets the work done, but if he gets an answer wrong on a worksheet I leave it for him to discuss with the educator. So far, this has worked beautifully. My guy has had strong, close relationships with his teachers and loves the process of figuring things out. Or he did, at least, until I freaked out and became a summertime drill sergeant. Just as Lahey lays out in The Gift of Failure, I was robbing my son of the most important aspect of his education—the ability to learn how to learn. When I stopped standing over him like some sort of spectre of discipline he—gasp!—actually started to read more and trying harder with his math problems. When we review his work in the evening, he’s excited to tell me how he came up with his answers. We tend to forget that kids are resilient. The big picture idea of humankind’s infinite ability to adapt, create, and innovate seems too big to connect to the idea of our kids’ third grade report cards. Perhaps, if we learn how to connect the big concept with the busier panic of the smaller one, our kids can learn about their resilience, as well. The kind of success children can achieve when armed with experiential knowledge of this resilience is one that is key to the possibilities of humankind. That kind of success is tangible to the individual because they can claim full ownership of it while retaining a hunger for more.